Plot:: DVD: Eve, A 9-year-old hardened by time as a neglected foster child, is accustomed to taking life seriously. So, when she meets Dave, a drunk thirty something who forgot to grow up, she sees an opportunity. Liars, Fires and Bears finds these two on an unlikely cross-country road trip after young Eve Hatches a plan to reunite with her absent brother, and laid-back Dave suddenly finds himself on the run from both the cops and the robbers. With a precocious tot behind the wheel and an immature man-child navigating, Eve and Dave may find the quickest route to their destination is through each other. Plainly and simply put, an awesome film. Truly something that needs to be seen to fully appreciate. A unique one-of-a-kind fresh and original piece of cinema that is lovingly created through an interesting story, but most of all wonderful acting. Truly imaginative piece. Loved the relationship between the characters Eve and Dave. Golden in so many ways. I love a good movie when it comes together with flawless characters and an interesting story. Very few movies today are truly original. Something I've noticed in today's movie world is the idea of creating a plot seems to have taken a trip and seems to not want to return. Thankfully there are companies like Brinkvision that understand and see the potential of truly independent cinema, and cinema that is often overlooked by the mainstream. 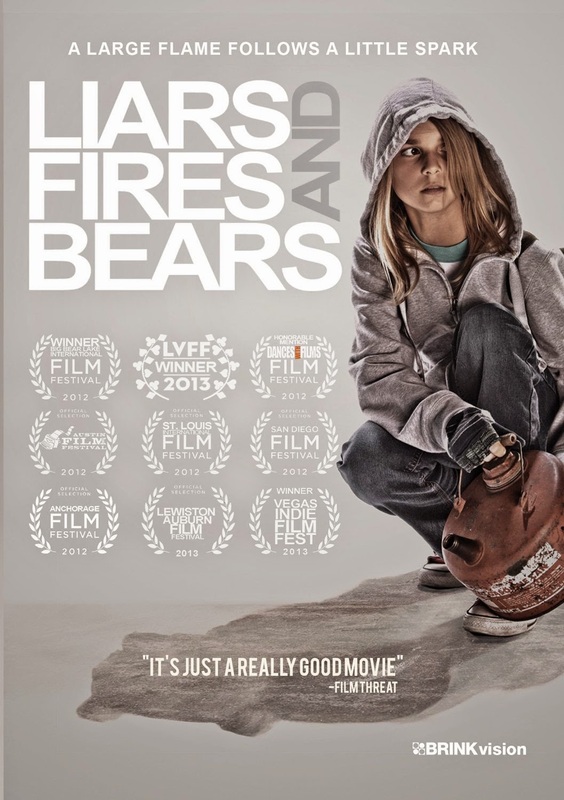 Brinkvision is the company that so far has never let me down in the outlets to films that deserve to be seen, and deserves to be experienced, and Liars, Fires and Bears is no different. It is one of those films that need to be seen. A wonderful directed film. Characters that are unique and perfect in so many ways. The story is something that really takes a hold of you, and you end up not wanting it to end. Your two main characters Eve and Dave are characters you will never forget. Both are thought out and each one is unique and gifted in the idea the viewer can understand them, experience them, and follow along with the plight that they are going through. Eve is brought to life by an amazing talented young actress. Megli Micek is fantastic as the main lead. She creates Eve and never lets the interest of the character die out. You can’t help but feel many emotions for her. Megli makes you experience those emotions in a believable way. Your next brilliant character is Dave, played flawless by Lundon Boyd, who might I add also brought the story to life and co-wrote along with the director Jeremy Cole. Lundon is magical in the part of Dave. Both Lundon and Megli have perfect chemistry together. Their relationship is outstanding and something that goes down in cinema history as being one of those pairs that demand to be remember and talked about. Eve is not an average 9 year old. She has hardships and it seems the only world around her has slowly beat her down to the point all she knows is how to take care of herself, our lock herself out from the human emotional side. Wonderful direction by Jeremy Cole. He adds a perfect sense of real life to the images and the flow of the film comes out as happening before your eyes. This is his first feature length film debut. I am stunned at that reality. He seems like a gifted pro in that department. Love the camera work and the focus on certain shots just bleed perfection in clarity and old-school skill. Soundtrack is awesome and just adds to the film. As you can see, I can't speak enough about this one. A one of a kind, unique and truly original, fresh piece of cinema. Thankfully as I have stated, this film will get to see the light of day and be experienced by the masses because of Brinkvision DVD. This is a film that was created in 2012, and has ran on the Independent Film Festival market winning awards, and being selected, and honored to play on many screens. I absolutely love Megli and Lundon. I want to be there friends and hang out with them. They are truly memorable characters that will stand the test time and always be remembered by me and now the movie watching world. Comical, emotional and downright brilliant in so many ways. Needs to be seen.